Eichlers are unique in that they appear to built from the roof down – not from the ground up. Their flat and low pitched roof slopes with the wide roof overhangs are the immediately recognizable features which set these architectural treasures apart from other contemporary or modern home designs. Armstrong Roofing has been helping to preserve Eichler homes in the San Francisco Bay Area by providing the most effective solutions for their Eichler roofs. For over three decades Armstrong has been installing the most reliable, energy efficient and cost effective roofing material to help Eichler homeowners enjoy their homes for decades with the minimum amount of maintenance. When you need to replace your Eichler roof, because repairing it is not viable, you have to consider several important factors. Most homeowners know that insulation, waterproofing, durability, aesthetics and cost are the most important considerations when replacing any roofing system. Of course, also make sure that you select a contractor like Armstrong Roofing who will be able to provide you with the quality and service you expect and demand. Are you happy with the capabilities of your existing roofing system? Do you want an energy efficient system with a highly reflective coating? Do you want a system which will add as little weight as possible to your Eichler’s supporting structures? Do you want a system with the highest level of waterproofing? Do you want a sustainable roofing system which will not only protect your Eichler but also start paying for as soon as it is installed? 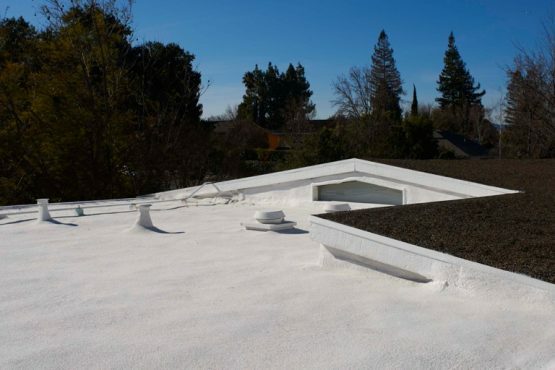 At Armstrong, we understand that Spray Polyurethane Foam (SPF) improves the performance of Eichler roofs and reduces energy costs significantly without altering the unique roof designs of these elegant homes. Since SPF is sprayed, it can easily conform to any roof design. Unlike build-up roofing systems, there is no layering or seams which moisture could potential penetrate and destroy your roof. The fact that SPF roofing systems do not contain seams means that Eichler roofs are provided with a durable waterproof barrier which can last for as long you own your homes. Moreover, the capability to custom contour the thickness of SPF roofing systems, any issues you may have experienced with drainage and ponding can be easily eliminated. Overall, there is no better roofing system to protect and insulate your Eichler home than SPF. The original tar and gravel roofs of Eichler homes provide very little insulation, as a result on hot summer days Eichlers tend to be extremely uncomfortable and in winter the heating costs can literally go through the roof. Additionally, tar and gravel roofs normally need to be replaced every 12 to 15 years whereas if SPF roofing systems are recoated once every couple of decades, they can last for a lifetime. Armstrong Roofing is San Francisco and the Bay Area’s original provider of Residential Foam Roofing. Therefore, our decades of experience has made us one the top installers of SPF roofing systems. Your Eichler home is a place of historical relevance and as it can also be part of the National Register of Historic Places, you need an SPF specialist with the experience to install your new roofing system properly. For more information about SPF roofing systems, contact Armstrong today. Armstrong has installed more residential foam roofing than any other company in America! And we offer you the best, longest-lasting warranties available! Before you consider any other roofing system for your Eichler, let Armstrong show you why our Bay Area Foam roofing is your best investment for your home!